It is undeniably the age of the Bollywood. Nothing wrong with that. Occasionally, evenings such as today, 22 October 2016, my faith is restored in the beauty of the artform of Bharathanatyam. 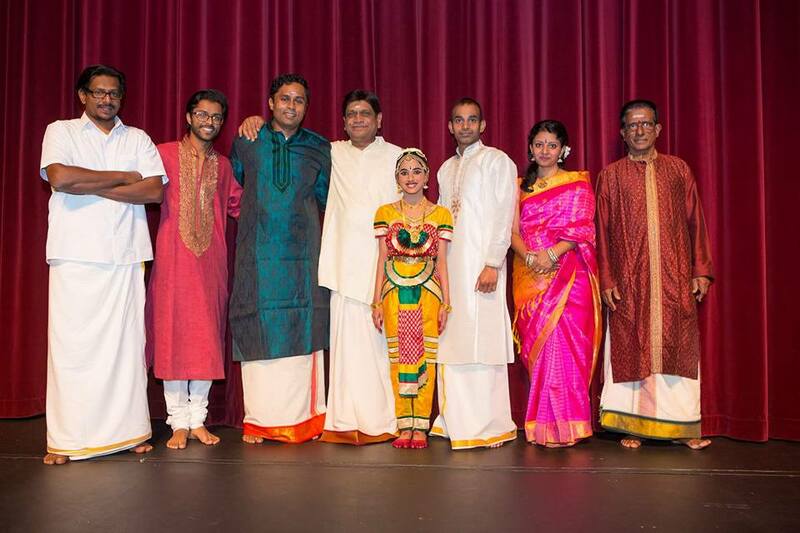 Hailing from the pages of several centuries of practice and tradition, it can never die for its force shall continue to entice and inspire human imagination as it did today, at the Arangetram of Vishakha Iyer held at Pymble Ladies College, Sydney. Guru Chidambaram R Suresh comes from such healthy bharathanatyam lineage as student of Dr Uma Anand and Prof CV Chandrasekhar. He is also awarded the title of Natyakalaimani and Nattuvanga Kalaimani in India, the Indian born Australian resident has taken his art seriously across borders. 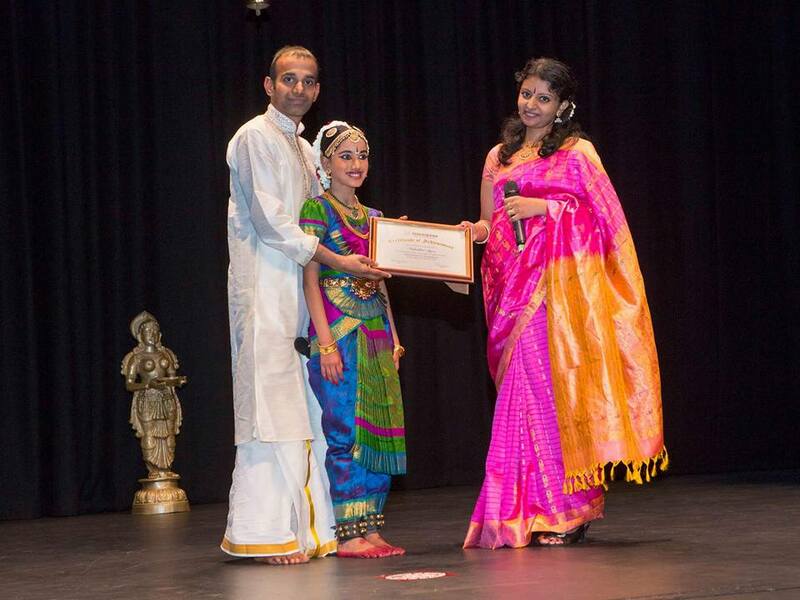 Sydney witnessed his rhythmic imagination take flight as his first disciple ten-year-old Vishakha Iyer executed every step to precision. This became evident not only when she commenced her evening with the Pushpanjali and the Chathusra Alarippu but also the Jathiswaram, set to a Ragamalika in a rarer thalam Sankeerna Chappu. If I was holding my breath, it was partly because I was finding it hard to keep count, but also because I was unbelievably watching this young slip of a girl beat away in perfect unison, foot hand and body in complete control and ease. What followed was equally enticing in the Shabdam, set to Mishra Chapu. The main piece of was evening was the Varnam where young Vishakha successfully once again portrayed the rare story of Avvaiyar, the tamil poet, a Lord Ganesha devotee who is bestowed with the gift of poetry, Vishakha portrayal as an old woman was excellent. She continued to show her amazing prowess at completing all the intervening interesting jathis with nimble footwork and perfect hand eye coordination, keeping all the lines straight, all the angles curved at elbow and knee. Vishakha’s portrayal of the famous stories of Ganesha continued as she portrayed the birth of Ganesha as the protector of his mother Parvathi and Ganesha taking three circles around his parents proving that the world indeed rests in the arms of those who revere their parents. Vishakha’s amazing stamina and unflinching performance across the first half was a true testament of her training, practice, perseverance and commitment. Following the interval, in the Meera Bhajan, which Vishakha Iyer had learnt from Bragha Bessel, a doyen of Bharathanatyam and an exponent of Bhava, Vishakha successfully portrayed Meera’s undying love for the Lord Krishna as she swallows the poison unharmed. In a description and portrayal of Shiva Vishakha Iyer danced merrily to Ananda Natamidum Pathan set to ragam Kedaragowlai. This was followed by the Keerthanam in Karaharapriya in ‘Gummana Kara’ where Vishakha’s portrayal of Little Krishna was sweet and entertaining. Not just blessed with one teacher, Chidambaram but his wife also an accomplished dancer Shobana Suresh, Vishakha received her certificate for completing her majestic attempts at first stepping on to the stage. For a first full solo performance, this was absolutely grand. The finale for the evening was the Thillana in Ragamalika composed by Dandayuthapani Pillai, where the young dancer’s exchanged rhythmic conversations with her percussionist, Pallavarajan Nagendran and Guru Nattavanaar set the house on fire. This was one outstanding inspiring Arangetram.